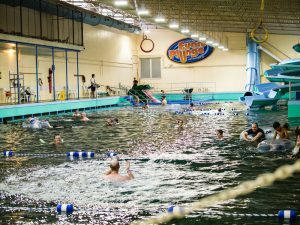 Spend a refreshing, fun-filled day at Evans Plunge, the World's largest natural warm water indoor swimming pool. Try our waterslides or relax in our gigantic pool filled with rejuvenating naturally warm mineral water (87 degrees F). This sparkling spring water flows from an enormous thermal spring at a rate of 5000 gallons a minute. The therapeutic "healing" water has soothed visitors for over one hundred years. Today it's no different, only with more excitement available with three Waterslides, Tarzan Rings, Fun Tubes, Kids Pools and a full service Health Club. Enjoy some quality time with your family at Evans Plunge; it will make everyone feel younger. Other Specials & Coupons To view Evan’s Plunge Admission Tickets, other Specials and Coupons, go to their special page by clicking here. Evan’s Plunge updates this page throughout the year, so check back to see if new specials and coupons have come in. Note to our visitors Evan’s Plunge coupons and specials can change without notice. So please visit their official website to make sure of the latest pricing and coupons.